One of UC Davis’ natural reserves is shut down and two others are taking precautionary measures as the County Fire continues to rage nearby. Stebbins Cold Canyon Reserve, an ecological preserve that also serves as a popular hiking destination, closed two days before the fire started because of “red flag” conditions that include a higher risk of fire. Nearby road closures are now keeping it closed. 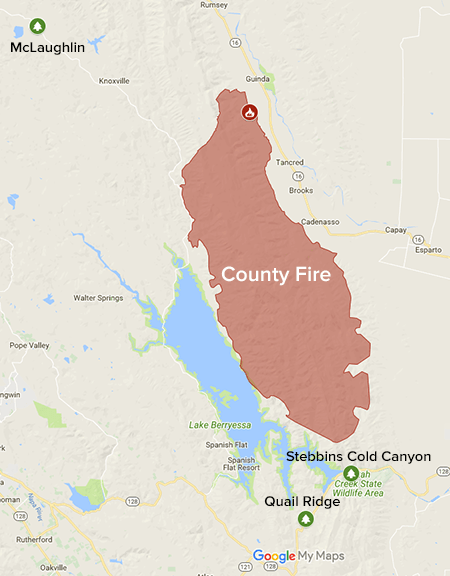 Both Stebbins and Quail Ridge Reserve are only a few miles away from the southern perimeter of the fire. The County Fire is a few miles away from some of UC Davis' natural reserves. Stebbins spent a year closed to the public after the 2015 Wragg Fire burned trees, brush and trail features, reopening in May 2016. “Unfortunately, we have a lot of recent experience with fires lately and although every situation is different, we have a good response mechanism in place,” said Shane Waddell, director of Quail Ridge. Research activities at Quail Ridge were halted over the weekend, and visiting New Mexico State University students who had been temporarily staying onsite were evacuated Monday (July 2). Biological samples, data sheets and other irreplaceable research materials have been moved on campus for safe-keeping, Waddell said. North of the fire, staff are still preparing at McLaughlin Natural Reserve, mowing around key weather equipment to create a defensible space. The School of Veterinary Medicine’s Veterinary Emergency Response Team, or VERT, remains on alert, and this morning attended a briefing at the fire command center in Woodland and met with state Sen. Bill Dodd, whose district encompasses the fire. Cal Fire reported this morning that the County Fire had grown to 70,000 acres and was 5 percent contained.